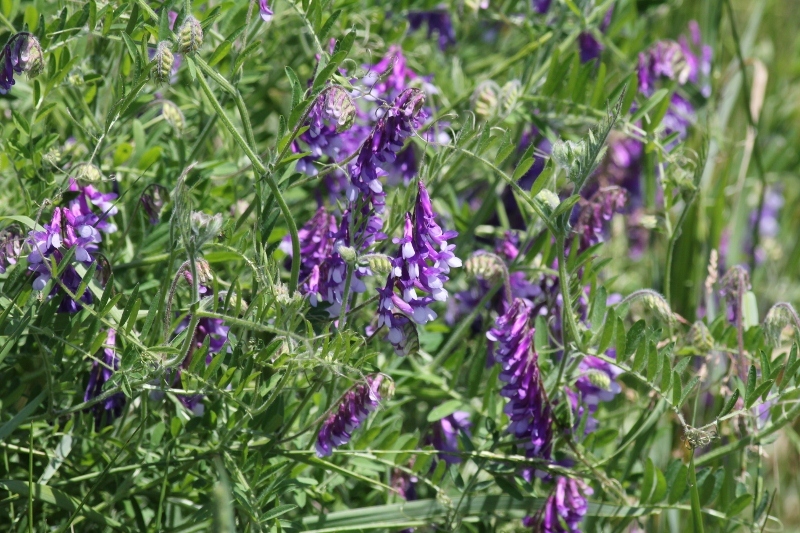 The meadow was filled with mostly purple and yellow wildflowers, and smaller numbers of white ones — so pretty. Late one evening a few days ago, realizing that I had a completely open schedule the next day, I decided I’d head out in the morning to Orion Oaks County Park to try to find some sparrows. In addition to lots of wooded trails, this park has a huge open meadow that always has lots of sparrows singing in the tall grasses. I’ve been frustrated by sparrows in the past, having trouble telling them apart by sight or by sound. So you’d think I would have listened to some songs of the likely species before I got out in the meadow, right? Nope. It didn’t even enter my mind. So, as poorly prepared as I was, it’s not surprising that I got frustrated again. Sure, I heard plenty of birds singing. But the only ones I could identify were the Chipping, Field, and Grasshopper Sparrows. I could have used my Audubon app to listen to some songs while I was out there, but it’s so hard to see the menus on the screen in the sunlight that I didn’t even try. I’m going to spend some time doing the song quizzes on Larkwire before my next outing, and hopefully I’ll start making some progress toward mastering the sparrows. If you’ve never tried to find sparrows (other than the abundant House Sparrows at the fast food drive through), you might not appreciate how hard they can be to see. They have this maddening habit of singing while they’re hidden in the tall meadow grasses, only popping up briefly and usually too far away to see well. 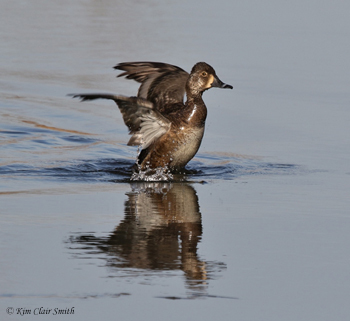 And even when you do see them, they all look like, well, “little brown jobs” (birders even refer to them as LBJs). Until you begin to learn the differences in body shape and size, and habitats, and songs, that is. Only then can you start to make sense of them all in the field. It’s a challenge that I considered not even bothering with two years ago, but as I slowly learn more and more birds I find that it’s not as daunting to add some of the harder ones to my knowledge base. I’m still not ready to tackle gulls though…talk about difficult birds! The only dragonfly to sit still for me that day! 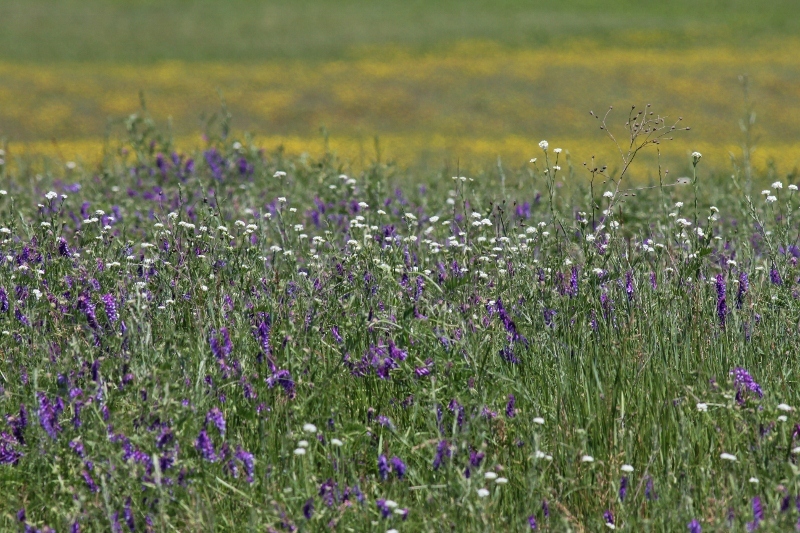 I just loved how the meadow looked with the vast expanse of purple and yellow. I tried to get some photos of a Mourning Dove on the grass with the flowers in the background, but the bird didn’t want to cooperate for that one. And let’s not forget the curious Grasshopper Sparrow either. I really love the little bits of yellow above the eyes and on the leading edge of the wing (you can barely see that part in this photo). The other birds I saw that day included Tree Swallows, Cooper’s Hawk, Baltimore Orioles, Indigo Bunting, Eastern Bluebirds, Eastern Kingbird, and a few more. And even a little garter snake that scared the bejeebers out of me when he slithered across the path in front of me. 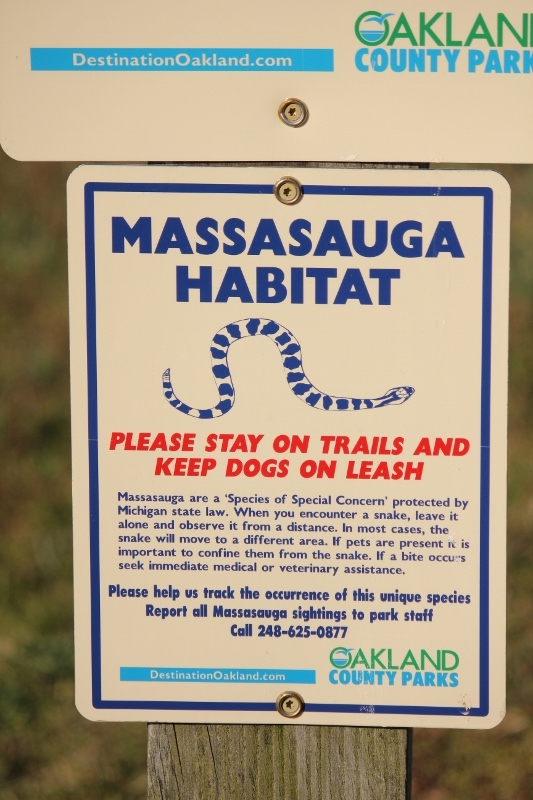 I’m always a bit on edge in that park because of all the signs warning about the Massasauga Rattlesnakes that breed there, so my brain was on high alert. I’d love to see one of those rattlesnakes, but just not too close up. Heck, I feel brave just walking past the warning signs! This entry was posted in Birds, Deer, Insects and tagged Butterflies, little brown job, nature, outdoors, poult, sparrows, wild turkey. Bookmark the permalink. Wow Kim! You managed quite a nature tour on this outing! Isn’t it special when you have opportunity to see so many species of bird, mammal and insect? Just think how much of this people miss, caught up in their own thoughts, being self-absorbed, or engrossed in their techy gadgets? 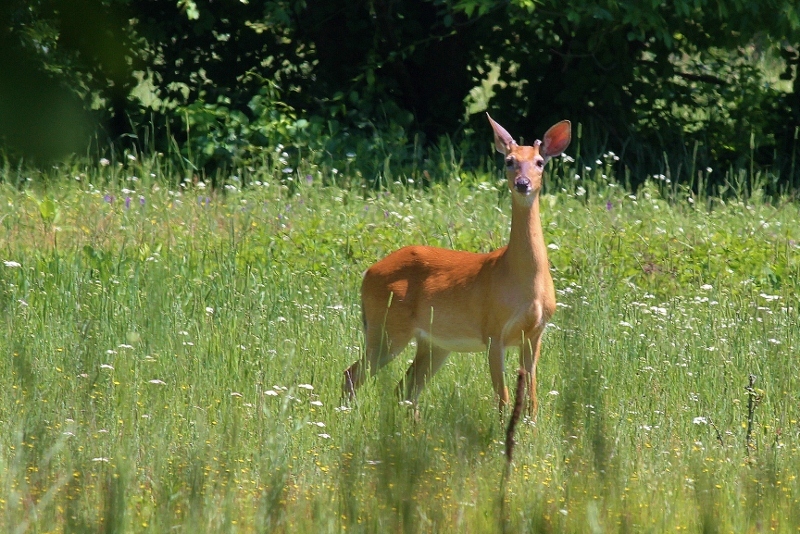 Daisy sometimes nurses one of her fawns in the pasture, right there in view of passers-by in the street, both walking and in vehicles, and no one notices! What a great day you had… I really loved all of the photos! How in the world do you capture a Butterfly in mid-flight? 🙂 Great shot!!!!!! Thanks Rob! I was practicing with fast shutter speeds and took lots of shots. I was pretty thrilled to get even a couple good shots out of the bunch because butterflies have been so tough for me to shoot. Along with dragonflies…oy. It sounds like it was a lovely outing, even if you couldn’t identify as many sparrows as you had hoped to. You have way more courage than me. There is no way I would be walking in a rattlesnake breeding ground. I wouldn’t even knowingly go through a garter snake breeding ground! It’s not as dangerous as it sounds, Kristie, or I wouldn’t be out there either. The mowed paths are very wide — probably 10 feet — so it’s pretty safe if you stay to the center of the path. At least I hope so. But remember – the centers of those paths are where the snakes love to lie to bask in the sun.